This is a 5-night, 6-day workshop. Your adventure begins at noon on June 25 and ends after a final slideshow on the afternoon of June 30. Lodging is covered from the night of the 24th through check out on the morning of the 30th. The first meal is dinner on the 24th, and the last is brunch on the 30th. You may book an additional night on the 30th directly with the hotel if you like. Unlike most NPAN workshops, this is inclusive of lodging and all meals during the workshop. The cost of your experience varies by your choice of accommodation. Each room type is offered on a first-come, first-served basis. Each ticket includes workshop tuition, breakfast and dinner each day, a picnic supper, brunch on the last day, and gratuities. Note: A deposit based on the accommodation you choose is required to reserve your spot at the workshop. The balance of $2,000 is due on March 27, 2018. Or, if you would like to pay in full up-front, you may choose the "Deposit" and the "Balance" tickets simultaneously. Last day for a cancellation request is March 26 (see details here). The workshop fee does not include transportation to and from the park, or during the workshop. Everything else except alcoholic beverages and optional gratuities are included. As with all Passport Series workshops, we will teach at this location only once. If you have a dream of making epic long exposures at night at Capitol Reef National Park, we hope you join us. we will teach at this location only once. If you have a dream of making epic long exposures at night at Redwood National and State Parks, we hope you join us. The full moon occurs smack dab in the middle of this 5-night, 6-day workshop, and we may experience foggy conditions. Despite the month of June being high season for Milky Way photography, we have chosen the full moon week for the workshop to ensure the best photographic conditions for the foggy environment, and to experience the magical quality of moonlight on the landscape. We will be teaching participants in this workshop to embrace whatever light is available—starlight, moonlight, flashlights or fog lights! This workshop is inclusive of lodging and all meals from breakfast on the first day to brunch on the last. Night photography experience is helpful, but not necessary. Even those with extensive experience shooting at night will find this class challenging, stimulating and inspiring. For advanced photographers, we can offer a portfolio review, specific challenges and goals, and will offer guidance in the field if you mainly want to concentrate on creating portfolio images or learning more advanced techniques. We hope to push you to step outside your comfort zone—to test the limits of what you and your camera can do. You’ll go home after the workshop with a solid grasp of how to make the most out of any potential night photography situation. Because of the wildly divergent landscapes in this park, we’ll have opportunities to explore different techniques and tools. We’ll work in a coastal situation where awareness of the tides is critical, and use the rocks and driftwood on the beaches for foreground subjects with the sea stacks, ocean and sky for our background. We’ll photograph the higher elevation and open landscapes of the prairies. 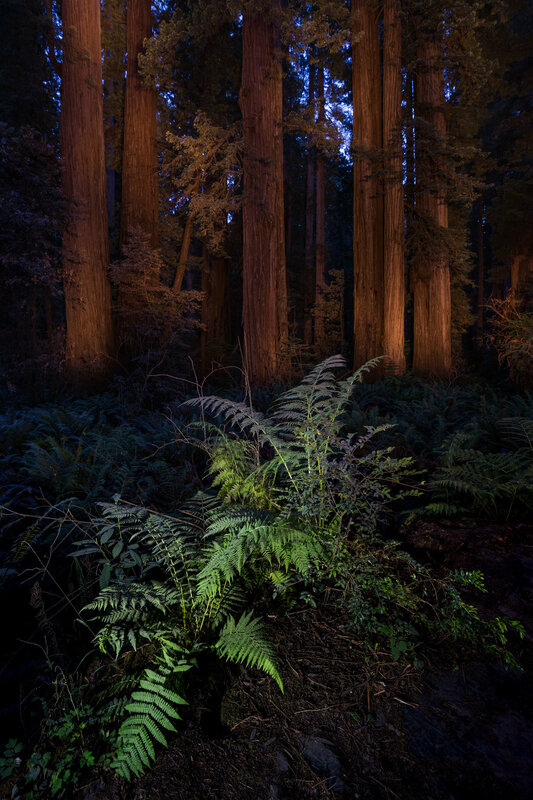 Most of all, we’ll photograph in the redwood forest, where only a little moonlight reaches the forest floor. The forest presents opportunity for light painting on a very large scale! The home base of the workshop will be in Klamath, California. You are responsible for your airfare and car rental. (There is no need for four-wheel-drive or high-clearance vehicles.) If you are interested in sharing a car rental, let us know and we will try to connect you with someone in the group. We wholeheartedly encourage carpooling! There are several choices for airports. Crescent City/Del Norte is the closest by far, but has limited flight options. Rogue Valley/Medford has a few more options, and is 2 1/2 hours away. The Bay area airports and Portland have lots of connections, but are all about 6 1/2 hours away by car. Below are links to the various options. We will have an early riser continental breakfast at 8, a full breakfast at 10, and an early supper around 5 each afternoon. Our base will be the wonderful Requa Inn, a small historic hotel in Klamath, California, at the mouth of the Klamath river, home to the indigenous Yurok tribe. The hotel is owned and operated by a Yurok family who purchased the inn in 2010. You’ll notice that there are several different prices for this workshop—what you pay depends on your room selection. Every room is different. Some have river views or prairie views, some have full, queen- or king-size beds, some have vintage claw-foot tubs. Two units have their own kitchens, and one is a stand-alone cottage, one-half mile away from the hotel. Each is available on a first-come, first-served basis. Coastal California is well-known as one of the foggiest places in the world. Typically the fog burns off by midday, and returns at night, although some days remain foggy all day and night, and sometimes the nights can be crystal-clear. One thing for certain is that the fog is unpredictable. Daytime highs range from 55 to 80 F,, and nighttime lows generally are about 50 to 55 F. The fog can make it feel colder, and it is often windy along the coast. Recommended attire: The workshop attire is casual and comfortable. Wear what makes you feel at home. Dress in layers, bring a mid-weight coat and a hat. We may be walking on muddy trails, so hiking shoes or boots are a good idea. No vigorous activity will be required, but please consider your physical abilities and limitations prior to registering. You should be comfortable carrying your own equipment over uneven ground in the dark. The longest distance we will walk is 1 1/2 miles each way on an easy path. There may be a couple of spots with steep uneven access to get down to the beach. Most locations will be within one-quarter mile of the car. As a former resident of San Francisco, I’ve passed many an afternoon walking the trails of Muir Woods National Monument in Marin County. Muir Woods is all about the trees. Tall trees. Very tall trees. Whenever I needed a break from the noise and commotion of the city, I’d go for a ride on my motorcycle across the Golden Gate Bridge, and inevitably end up at Muir Woods. To me, a walk in the forest or a swim in the ocean is the best way to de-stress. Recently, the Japanese phenomenon known as “forest bathing” has gained popularity in the U.S., and for good reason. People who take regular walks in a forest have demonstrated measurable changes in immune markers and stress hormones, part of which may be attributed to breathing in antimicrobial volatile organic compounds derived from trees called phytoncides. It seems that spending time in the forest doesn’t just feel good, it is good for you. Whatever the reason for it, spending time among the redwoods is truly a humbling experience. There is really no way to explain the feeling of standing beneath these giants, be it the first time or the hundredth. It is a privilege to be with them, and a worthy challenge to do them photographic justice. In the ten years I lived in California, I visited Sequoia and Kings Canyon National Parks, which are home to the Giant Sequoia, a stouter but slightly shorter redwood tree. I spent time with coast redwoods in Marin, Santa Cruz, Monterey and Mendocino counties, but never quite made it to Redwood National and State Parks. I knew that I had to go, so it was with great eagerness that I signed up to lead this workshop. Having just come back from my (first) scouting mission, the park didn’t disappoint, and I know you will cherish the experience too. I hope you will join Chris and I in this most special of our national parks. The coast redwoods (Sequoia sempervirens) are the tallest trees on earth, and are among the oldest living things. They can live as long as 2,000 years. The tallest living tree is 379 feet, and the widest nearly 30 feet in diameter, but there are stories of trees that rose to heights of over 400 feet before logging began in the mid 19th century and reduced their territory from over 2.1 million acres to just 120,000 acres of old growth forest today. Milky Way The galactic core is visible as soon as it’s dark. The Milky way arches across the eastern sky.